If your time is worth $100 per hour and it takes you 10 hours to reconcile your books and / or prepare taxes, that's costing you a $1,000.00 to do these tasks yourself. And there's always the risk of errors when multi-tasking like so many business owners do. Having an accountant perform these tasks will require less time because of their expertise and cost less in the end run. In addition, there is peace of mind that your accounting is done correctly the first time. As a small business owner, one of the biggest rewards is having control. You can set your own working hours, craft your business strategy, regulate your workload (at least to some extent) and determine your own finances. And being the master of all of these things is an empowering and liberating feeling. Unfortunately, this can be a hard habit to break out of because of our reluctance to delegate and ask for help. You might feel that no one can possibly know your business as well as you do, therefore nobody can handle any part of your business as well as you can. At some point you will have to let go, and learn to trust other people to handle some parts of your business so that "burn out" doesn't consume you. Your business should be created to support the kind of life you want to live and that also means taking time to take care of YOU. 1. Greater convenience and flexibility. 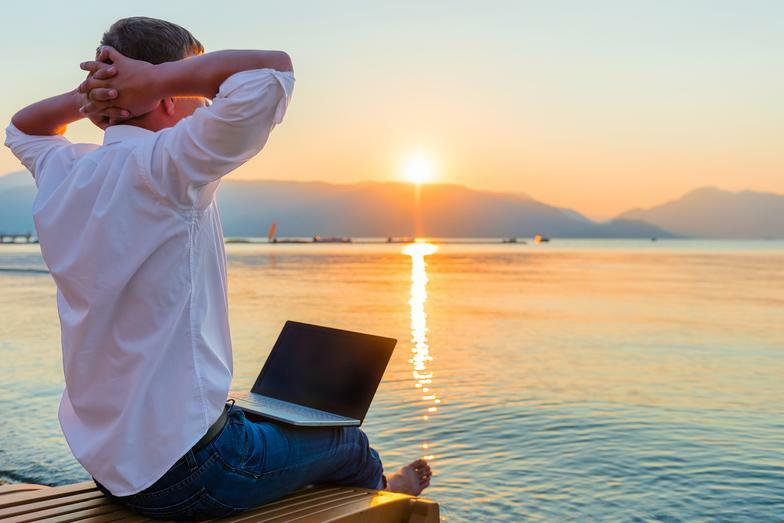 You can access your financial information from your home, your cabin, from the plane—anywhere you have a secure Internet connection. 2. Access to current information. Since cloud accounting eliminates the need to pass files back and forth, business owners always have access to the latest numbers. 3. Effecient. Banking and credit card data are electronically uploaded into QuickBooks. Data entry is kept minimal. 4. Enhanced collaboration. With the cloud, we can login to a client’s accounting software with them. This means we can talk through changes or updates, and answer questions immediately. 5. Automatic updates & back ups. You no longer need to spend the extra money to get the latest desktop version to meet system compatibility or worry about making regular back ups. Even if your your laptop or desktop computer is stolen, your data is secure. 1) Attracting more customers by "Building a Reputation"
2) Executing service by "Exceeding Expectations"
3) Increasing Profits by "Automating Systems"
He elaborates on these components with several more detailed tips such as getting your business involved with the community at community events and functions to "build your business reputation." However, because my main interest is in helping restaurants and bars understand their business from a financial perspective, I honed in on #3, Increasing Profits through "Automating Systems." Here Ryan emphasises the use of point of sales systems and acquiring real time financial data through a business accounting system. He stresses that restaurant and bar businesses need to have complete financial data within 5 days to a week once a month at the very least to evaluate business profitability. The reason this is so important is so that the business owner / manager can measure and adjust costs/expenses to income/revenue. Any increase or decrease in these numbers can be acted upon immediately to eliminate future problems such as over-buying of food, rescheduling of shifts if labor hours are too high, etc. As an accountant, I often witness owners struggling to maintain budgets because real-time financial data is not readily available to them. One of the most effective and quickest solutions to this dilema is to utilize a cloud based accounting software such as QuickBooks Online. Since financial data can be easily downloaded into the system within minutes, the owner / manager can run reports that provide them with this information as often as needed and make adjustments necessary to meet their budget goals. Question: Do you have an idea as to what that ideal labor cost percentage is for restaurants and bars? Answer: Certain fast food restaurants can achieve labor cost as low as 25 percent, while table service restaurants are more likely to see labor in the 30 percent to 35 percent range. Food costs (including beverages) for the restaurant industry run typically from the 25 percent to 38 percent range, depending upon the style of restaurant and the mix of sales. These are general and average percentages. But they are consistent amongst my restaurant and bar clients, most of which are around 35%, table service. Question: How does the owners salary factor in? Is it normally just added to gross wages? Answer: Yes....because, particularly in an S-Corp, ultimately the bottom line is what you're paying attention to. Shareholder distributions are based on the actual profit which means that salaries need to be part of the overall budget.